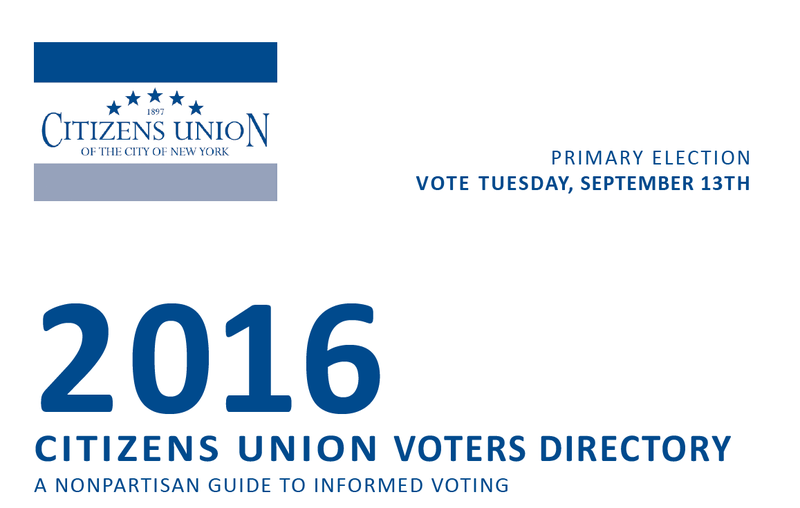 Welcome to the Citizens Union 2016 Primary Election Voters Directory online! This Tuesday, September 13th, New Yorkers will vote in the state primary to select party candidates for State Senate and Assembly. An overview of the 2016 elections, including voting and registration information and listings of every contest for all races that will be on the ballot in New York City on September 13th, 2016. A roster of Citizens Union’s preferred candidates in several key districts, and information about the rigorous evaluation process and assessments of candidates. A report on incumbents running uncontested for seats in the NYS Legislature. A report on special elections and open seats. Please also note that this directory does not contain candidates for Delegate to the Judicial Convention, district leaders, or committee positions. To obtain this information, visit the NYC Board of Elections website at http://vote.nyc.ny.us or call (866) VOTE-NYC. To learn more about our evaluation principles and process click here. Our past preference and endorsement decisions are also available. Have questions about voting and registration? Find information here. Find your district and polling place. This Voters Directory would not be possible without the hard work of members of the Citizens Union Board of Directors, Local Candidates Committee (LCC), staff and our summer interns. 42 Volunteer LCC members, 7 interns, and 6 staff members formed nonpartisan interview teams and evaluated 35 candidates in 15 races for State Senate and Assembly races. We also secured the answers to our questionnaire from many more candidates. We thank them for contributing their time, energy, expertise and commitment this summer to interviewing and evaluating candidates. You must be a registered member of that party. You cannot change your party registration to vote in a primary during that same year. Party registration changes must be filed 25 days before the previous year’s General Election. detained in jail awaiting Grand Jury action or are confined in prison for an offense other than a felony. Mail your Absentee Ballot Application or Letter of Application by Saturday, September 6th. Apply for an Absentee Ballot in Person at your local county board of elections office by Monday, September 12th. Mail in your Absentee Ballot with a postmark by Monday, September 12th – it also must be received by the local board of elections no later than September 20th. Drop off your Absentee Ballot by Tuesday, September 13th to your local board of elections office – a friend or relative can drop it off. Under federal law, if you are disabled and choose to vote in person rather than by absentee ballot, you are entitled to assistance. You can rely on the election employees for help. At the polls, if you are not on the voter registration list, it may be because your registration form was not received in time or was filled out incorrectly. If you believe that you are eligible to vote, you can still vote by requesting an affidavit ballot. After the election, the Board of Elections will check its records and your vote will be counted if you are indeed eligible. Paper ballots will be used for casting votes, which can be marked using either a pen or a ballot marking device (BMD) as described below. Ballots are counted after they are inserted into an electronic scanner. The scanner will then be used to count the votes after the polling place has closed at the end of Election Day. A bin attached to the scanner will capture and keep the paper ballots as a record of all votes. This new process began in 2010 with New York’s adoption of a new voting system to meet federal accessibility requirements. Enter the poll site, sign in, and receive your paper ballot from the poll worker. Use a Ballot Marking Device (BMD), which is available for those who are in need of assistance (see below for more information). Once done, place your ballot in the privacy sleeve, proceed to the scanner area, and insert the marked ballot into the scanner to cast your vote. You ballot can be inserted in any direction. If you make a mistake you can request a new ballot. If you mark your ballot incorrectly by marking more choices for one contest than you are supposed to, the scanner will notify you of an “overvote.” To have your vote count, you must obtain a new ballot and mark your choices correctly before submitting your ballot.